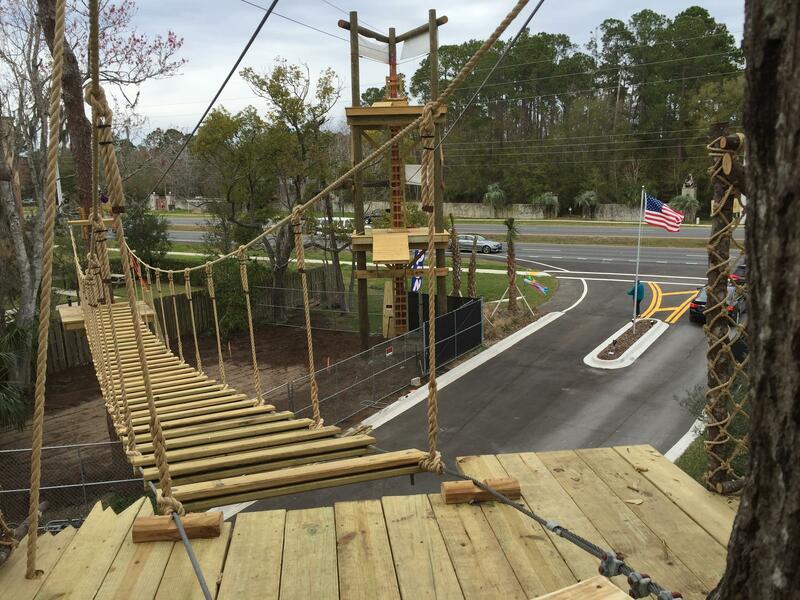 Footbridge and zipline at the St. Augustine Aquarium. Guests can zip through the ZIPStream Castaway Canopy Adventure tucked away next to a Courtyard Marriot Hotel on State Road 16, which is the last part of phase one for the aquarium that opened in December. Listen to the radio version at 89.9 WJCT. 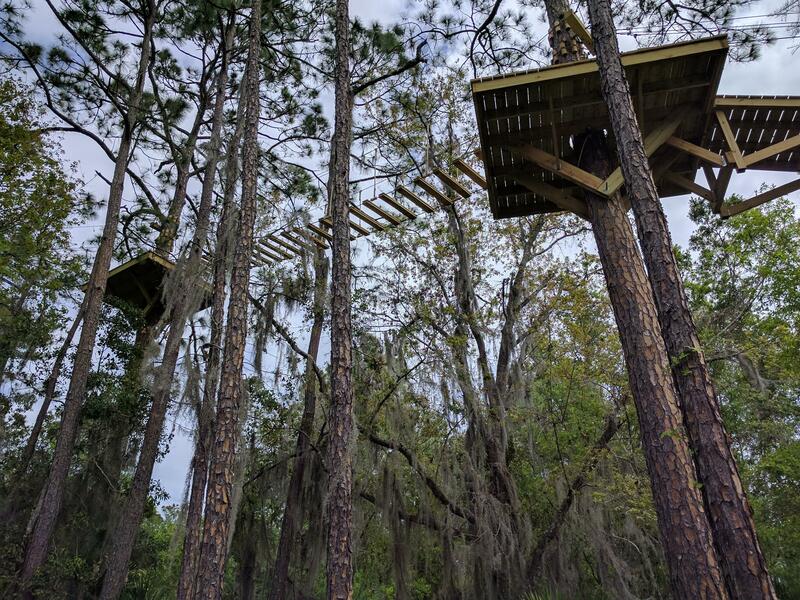 Don Stock, co-owner of ZIPStream, said as a child he used to experience nature by building forts and running through the woods, but he feels people have lost that experience and wants to make it more widely available through ziplining. “What part of the ZIPStream brand is about is getting people out of those synthetic environments and back into the natural world because we believe it does something good for your spirit when you’re in those places,” said Stock, who added the company has been building the course for about a year and it should be open in late April. 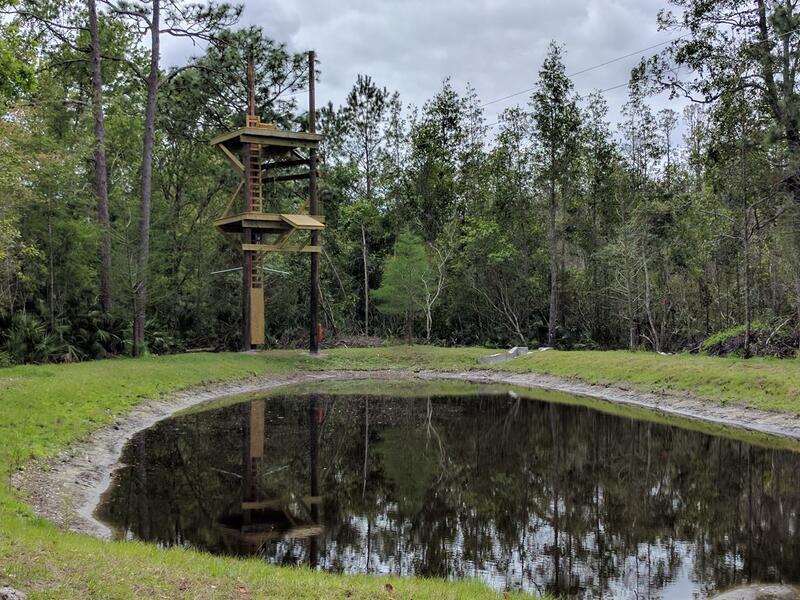 He said the course will have a guided tour and zip over the aquarium's shark and ray cove, and into the protected wetlands at the back of the property, giving guests a bird’s-eye-view of the different tree-canopy habitats available. Stock said it’s a way to make a difference in people’s lives. “People come to these activities with fears and anxieties, and by the time they get to the end, they’ve conquered it. They’ve had something impact them that maybe they would never have tried before,” Stock said. The second and third phase of the aquarium include expanding the parking lot, adding eco-specific habitats and a shipwreck reef with sharks and a shark cage, according to the St. Augustine Aquarium website. Until then, patrons can visit the aquarium to snorkel with Florida reef fish and hand-feed sharks.